"Tomorrow I have to wake up at 3 AM to see the sunrise at Angkor Wat, a local beer send me straight to bed. Woke up at 3 AM, and my private driver was waiting for me at the hotel lobby (Very punctual). He drove me to the ticket booth, and I paid $30 USD for a one day access to all temples. My driver reminded me that I have to keep this ticket at all times because there will be guards at the entrance of every temples checking my pass. It was a little cloudy but still, it was magnificent. Especially the sunlights reflecting in the water. Magnificent......."
Angkor Wat, built during the early years of the 12th century by Suryavaram II, honors the Hindu god Vishnu and is a symbolic representation of Hindu cosmology. But within 200 years, the powerful Khmer civilization mysteriously collapsed. Theories of its downfall abound but nothing is definite. You see, aside from limited temple inscriptions no written records of the great Khmer Empire survived its demise. Angkor Wat is surrounded by a moat and an exterior wall measuring 1300 meters x 1500 meters. The temple itself is 1 km square and consists of three levels surmounted by a central tower. The walls of the temple are covered inside and out with bas-reliefs and carvings. Angkor Wat was constructed as a Hindu temple, it has served as a Buddhist temple since Buddhism became Cambodia�s dominant religion in the 14th century. Angkor Wat is visually, architecturally and artistically breathtaking. It is a massive three-tiered pyramid crowned by five lotus-like towers rising 65 meters from ground level. 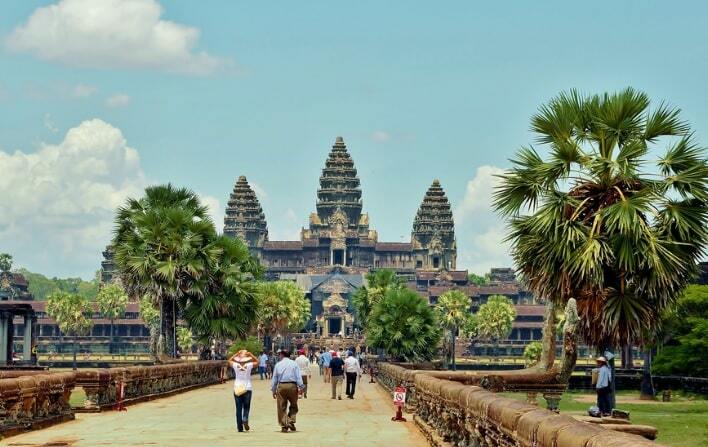 Angkor Wat is the centerpiece of any visit to the temples of Angkor. Almost 2000 distinctively rendered apsara carvings adorn the walls throughout the temple and represent some of the finest examples of apsara carvings in Angkorian-era art. The exterior walls display the most extraordinary bas-reliefs, depicting stories and characters from Hindu mythology and the historical wars of Suryavarman II. Centuries passed and dense jungle swallowed the magnificent Khmer temples and cities. But in the 18th Century, French explorers rediscovered the ruins, initiating 150 years of intense scholarship that continues today. Mouhot is often mistakenly credited with "discovering" Angkor, although Angkor was never lost � the location and existence of the entire series of Angkor sites was always known to the Khmers and had been visited by several westerners since the 16th century. Mouhot mentions in his journals that his contemporary, Father Charles Emile Bouillevaux � a French missionary based in Battambang � had reported that he and other western explorers and missionaries had visited Angkor Wat and the other Khmer temples, at least five years before Mouhot. Father Bouillevaux published his accounts in 1857: "Travel in Indochina 1848�1846, The Annam and Cambodia". Previously, a Portuguese trader Diogo do Couto visited Angkor and wrote his accounts about it in 1550, and the Portuguese monk Antonio da Magdalena had also written about his visit to Angkor Wat in 1586. The visual impact of Angkor Wat, particularly on one's first visit, is overwhelming. After you cross through the gate and approach the temple along the walkway it slowly gains depth and complexity. The first level of is the most artistically interesting. Most visitors begin their exploration with the bas-reliefs that cover the exterior wall of the first level, following the bas-reliefs counter clockwise around the temple. The temple interior is not as densely carved as the first level exterior, but still sports hundreds of fine carvings of apsaras and scenes from Hindu mythology. A guide can be quite helpful in explaining the stories of the various chambers, statues and architectural forms to be found in the interior. Angkor Wat has always figured on Cambodia's national flag. 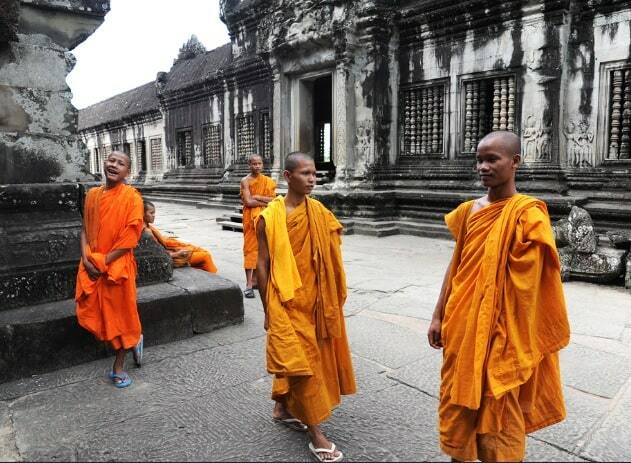 The temple symbolizes the soul of the Khmer people, and the lasting grandeur of their past. Since December 1992, Angkor Vat and other Angkorian monuments have been classed as UNESCO "World Heritage". This is a great honour for Cambodia, and a major national obligation. We are responsible for Angkor's preservation not only before history and in respect of our ancestors, but also, today, before the entire international community.